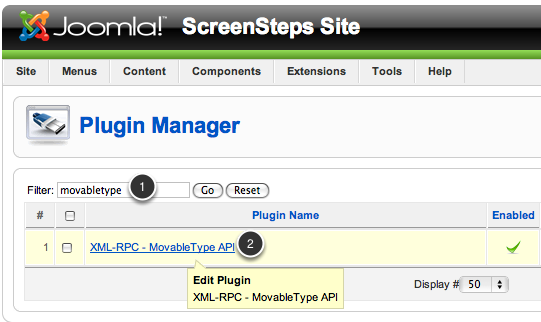 Before uploading from ScreenSteps to Joomla using the Movable Type Plugin you need to configure the plugin. Filter the list of plugins by "movabletype" (1). Click on the XML-RPC - Movable Type API plugin to edit the settings (2). The Plugin: [Edit] screen will appear (1). 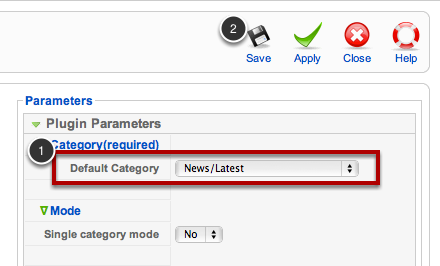 You need to set a default category in the Parameters area (2). Select a default category (1) and click the Save button.